By lukems, April 16, 2015 in Completed Scripts/Plugins/etc. 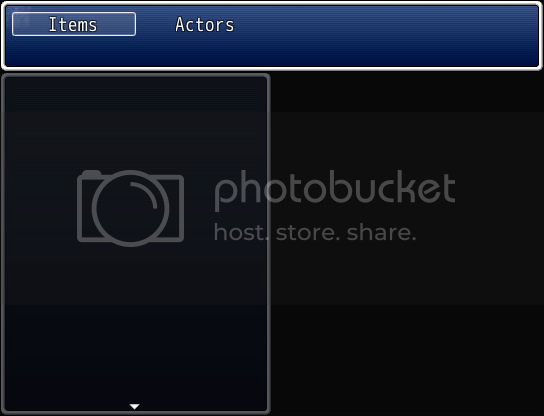 This script provides a window with detailed information on items and actors features (using Mr. Bubble's Reader Functions and Info Pages Window). It is based on Mr. 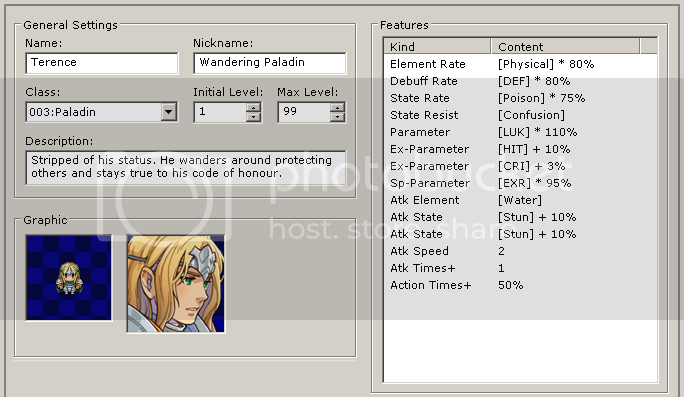 Bubble's crafting system's windows and scene, as it already provided most of the interactions and calls for those scripts. 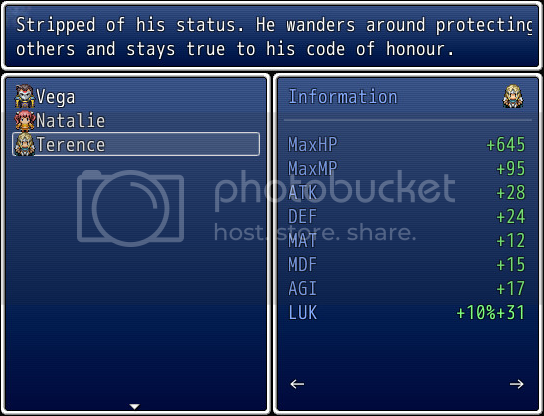 The purpose of this script was simply to provide an easy and detailed interface that could show in-game features, thus allowing the user to easily check actor's and item's advanced info. While developing a game I'm currently working on, I've noticed the pain it was to get to that kind of thing, and couldn't find a script that would provide a solution for that issue. Having used Mr. 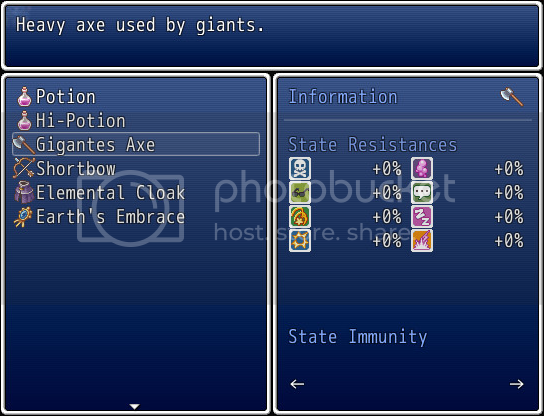 Bubble's "Tactics Ogre PSP Crafting System" before, it inspired me to use the great amount of quality info it provided during the crafting process to another more generic purpose, a regular item/actor feature status windows (considering that "features" have an identical structure, wether item's features or actor's features). Should it be useful to somebody, the script is free to use, just give proper credits (mostly to Mr. Bubble, actually) and, if possible, send me a word about it. 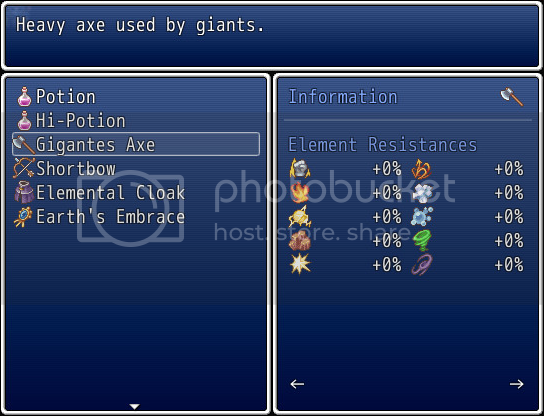 As a newbie to RPG Maker and scripting, any feedback will be appreciated. The scripts "Info Pages Window" and "Reader Functions", both from Mr. Bubble ( http://mrbubblewand.wordpress.com/ ) are required. Put this script below Mr. Bubble's scripts, somewhere between Materials and Main Process. You can chose to get features status from actors or items (includes items, weapons and armors in a single screen, will have subcategories soon). 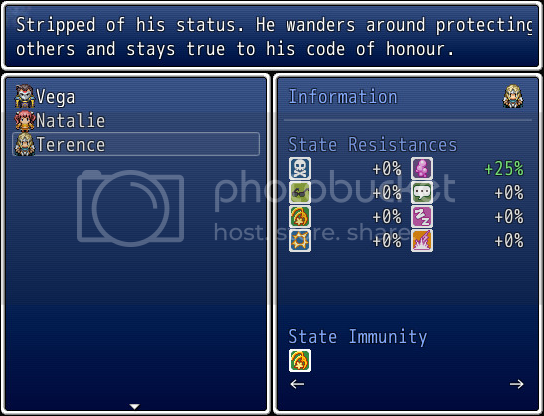 Selecting "Actors" as category will take you to a window where u can chose an actor from the current party members. Selecting "Items" as category will take you to a window where u can chose an item from the inventory. #     Mr. Bubble for his great and well documented scripts. 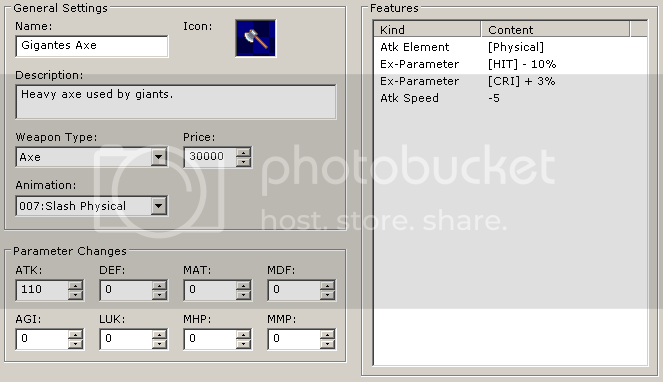 # his crafting system's windows and scene). # Should it be helpful to anybody, the script is free to use in any way. 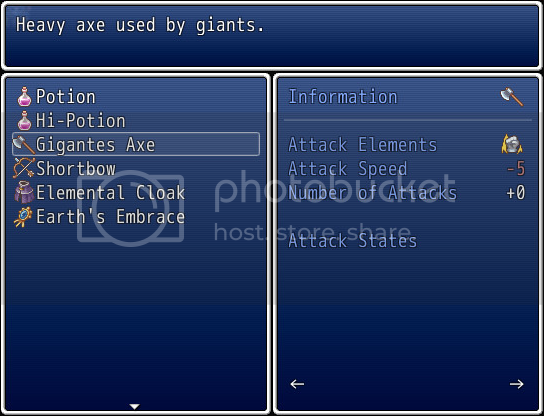 # As a newbie to RPG Maker and scripting, any feedback will be appreciated. # ( http://mrbubblewand.wordpress.com/ ) are required. # Recommend length: 22 characters   "                      "
# This setting determines the order of info pages for usable items. #   :item_info      # Requires "Reader Functions for Features/Effects"
# This setting determines the order of info pages for equippable items. #   :param_info     # Requires "Reader Functions for Features/Effects"
#   :attack_info    # Requires "Reader Functions for Features/Effects"
#   :element_info   # Requires "Reader Functions for Features/Effects"
#   :state_info     # Requires "Reader Functions for Features/Effects"
] # <- Do not delete.
} # <- Do not delete. # Requires "Reader Functions for Features/Effects" to see effects. # enable? # Display in Enabled State? # include? 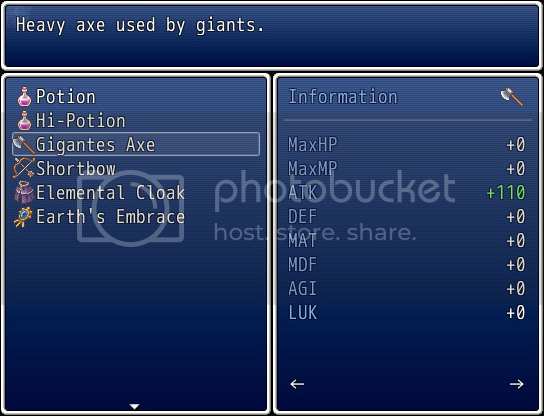 # Include in Item List? text = "This page requires"
text = "\"Reader Functions for "
text = "to be properly viewed." 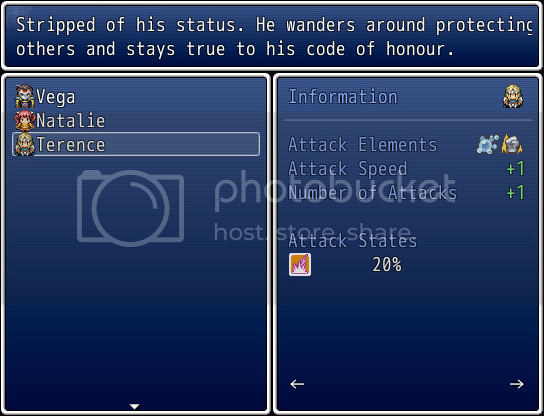 text = info_header_text(:atk_elements) # "Attack Element"
text = info_header_text(:atk_speed) # "Attack Speed"
text = info_header_text(:atk_times_add) # "Number of Attacks"
text = info_header_text(:atk_states) # "Attack States"
text = info_header_text(:state_rate) # "State Resistance"
text = info_header_text(:state_resist_set) # "State Immunity"
text = info_header_text(:element_rate) # "Element Resists"
text = info_header_text(:add_states) # "Add States"
text = info_header_text(:remove_states) # "Remove States"
text = info_header_text(:hp_recovery) # "HP Recovery"
text = info_header_text(:mp_recovery) # "MP Recovery"
text = info_header_text(:tp_recovery) # "TP Recovery"
# version of "Reader Functions for Features/Effects". Get v1.2 or above. 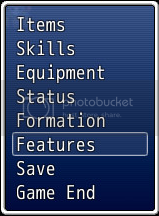 #  This command window appears on the menu screen. # ** Adds a specific drawing procedure for actors as items on a list. I'm very surprised this hasn't received any recognition. This looks like a great script. I'm going to test it out right now. Thanks and pls let me know what you think of it. It is rather unpolished tho. Having no clue about regexp forced me to work upon an existing script instead of writing one from scratch - and that could explain the lack of "recognition".